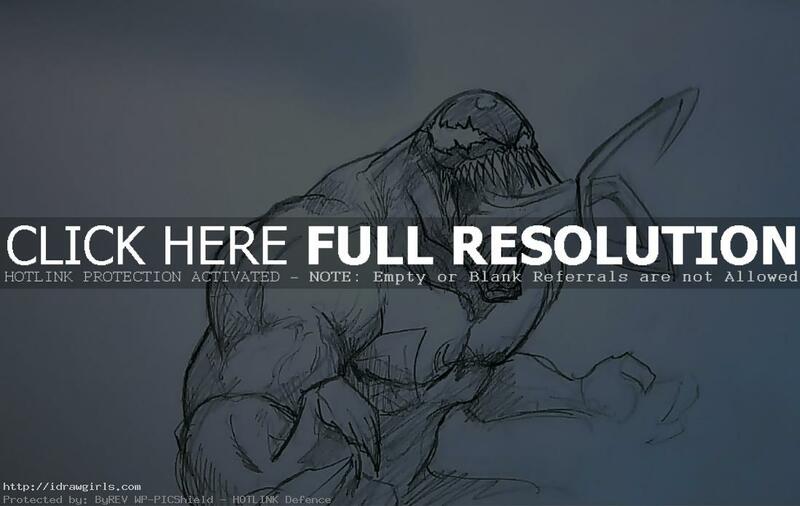 How to draw Venom a comics character from Marvel. In this tutorial you will learn to draw from two drawing instructional videos and step by step images. Hopefully many of you guys will learn how to draw Comics SuperVillain Venom. Both of the video from our basic comics character drawing series, one is traditional drawing using pencil and the other is digital drawing using Photoshop and Wacom tablet. These basic drawing video tutorials will help you gain knowledge of anatomy and dynamics pose, gesture and muscle details. You can also find step by step tutorial by scrolling down further. I know that many of you are enjoying these, and some of you are kinda like…well I want to see more advance stuff. 🙂 I’ve been busy working on the back end of the website, so I will have less time to do super cool art. So cool stuff are coming too. A bit about this character, Venom, or the Venom Symbiote, is a fictional character, a symbiote life form in the Marvel Comics universe. The creature is a sentient alien with a gooey, almost liquid-like form. It requires a host, usually human, to bond around for its survival. In return the Venom creature gives its host enhanced powers. In effect, when the Venom Symbiote bonds with a human to form a super-villain, that new dual-life form itself is also often called Venom. The symbiote, with or without a host, is one of Spider-Man’s archenemies. Spider-Man was the first host it merged with before its evil motives were clear. After Spider-Man rejected it, the symbiote went on to merge with other hosts and so began its reign as the villain known as Venom. Below are step by step drawing Venom. This one focus on the face and upper body part. Step one, I rough out just basic shape for head, chest, and shoulder. Step two, I draw his huge mouth with twisted long venomous tongue, then his other arm. Step three, I already have the base sketch layout and now I can draw over its head to make him look like Venom. Step four, then I slowly draw over all the base line beef up his muscles and then the final Venom drawing. Below are step by step drawing Venom with the whole body in action pose. Probably Venom and Batman. They should fight!